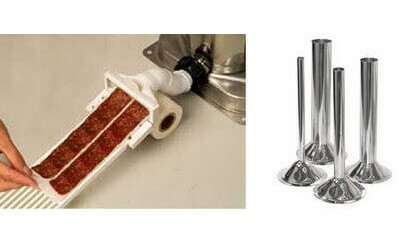 Sausage Stuffer parts such as stuffing tubes or attachments are available from One Stop Jerky Shop. Using the correct sausage stuffer part or tube ensures you are going to get the meat processing job done correctly. These Plastic Sausage Stuffer Tubes are 1 9/16" at the base where they connect to the sausage stuffer and are almost 5" long. Tube sizes are 1/2" (12mm), 3/4" (19mm), and 7/8" (22mm) ID and the OD measurements are 11/16" (17mm), 7/8" (22mm) and 1" (25mm). Very little taper.For use with many bra.. These Plastic Sausage Stuffer Tubes are 2" at the base where they connect to the sausage stuffer and are 8" long. Tube measurements are 1/2" (12mm), 11/16" (17mm), and 1" (25mm) ID and the OD measurements are 11/16" (17mm), 7/8" (22mm) and 1 1/4" (32mm). Very little taper. ..